Just one grammatically incorrect sentence in an online dating profile can turn off a potential date from responding to your email or contacting you. 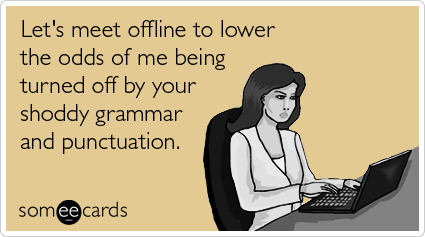 Has your Internet dating profile been proof-read and passed the spell-check and grammar check? Simple things such as making sure that words such as “I” are capitalized and that you avoid using acronyms and emoticons are critical if you want to be at the top of his or her list. Remember to proof read your emails before pressing the send button and take an extra moment today to review your profiles. If you’re looking for a profile that’s irresistible, contact us for more information on Irresistible Profiles to help you attract your dream date. Julie Spira is a leading online dating and relationship expert.? She’s the author of the bestseller, The Perils of Cyber-Dating: Confessions of a Hopeful Romantic Looking for Love Online. Visit her at CyberDatingExpert.com and follow @JulieSpira on Twitter.